China recently made two key economic decisions. First, the 13th Five Year Plan from 2016-2020 should achieve "at least 6.5% annual growth for China to become 'moderately prosperous" -- close to the World Bank's criteria for an "advanced economy." Second, December's Central Economic Work Conference announced that China's policy will concentrate on the economy's "supply side." This latter decision is welcome. Primary concentration on the economy's "demand" side is misapplied in either a "Western" economic framework or China's Marxist one. Switching focus to the supply side introduces greater precision into economic policymaking as specific numbers must be stated to calculate the requirements for at least 6.5% growth. There are only two fundamental frameworks of analysis of the economy's supply. • The first is "growth accounting," developed by U.S. Nobel Prize winner Robert Solow, which is the framework of "Western economics." This analyses the economy's "supply side" in terms of three inputs of capital, labour and total factor productivity (TFP) -- TFP being all growth sources not only due to inputs of capital and labour. • The second is Marx's, the official basis for China's policy, which analyses the economy in terms of capital, labour and surplus value -- the latter being numerically equal to profits, rent and interest. For present purposes, these may be reduced to one framework as both Solow and Marx in "growth accounting" are concerned with overall input-output levels and their other differences do not affect this. The study of economic statistics identifies that "supply side" Inputs have very different weights. Therefore, to achieve "moderate prosperity" not only the supply side's "algebra" but its "arithmetic" must be considered. Given that China's aim is to achieve moderately prosperous and even advanced economic status, the driving forces of the world's most advanced economy, the United States, will first be considered and then China's current differences to the United States analysed. The contrast indicates policies China must pursue to become an advanced economy. Figure 1 below therefore shows the sources of U.S. economic growth and these will be analysed in descending order to importance. The United States, as with all economies, has two capital inputs, the first of which is "Intermediate products" -- one industry's outputs used as another's inputs (e.g. outputs of steering wheel producers provide inputs into the automobile industry). Financially, as Charles Jones noted for the U.S. National Bureau of Economic Research, "intermediate goods are just another form of capital, albeit one that depreciates fully in production" -- they are "circulating capital." Increase in Intermediate products indicates a growing division of labour and accounts for 52% of output increases by U.S. economic sectors -- the largest growth source. The second capital input is "fixed investment," or the means of production depreciating over numerous production cycles. This constitutes 24% of increases in U.S. output. Growth in labour inputs account for 15% of U.S. output increases -- this growth being due to both increase in total time worked ("labour quantity") and improvements in training and education ("labour quality"). 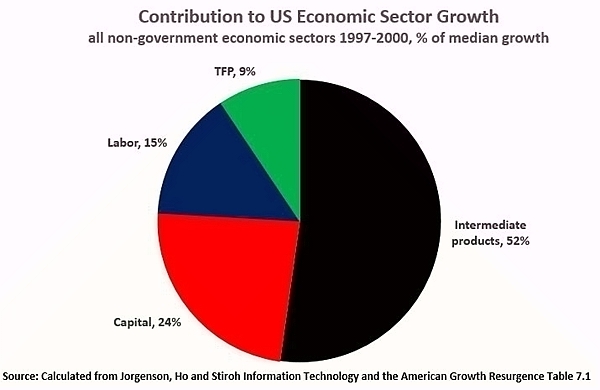 TFP, increases in production due to technology, entrepreneurship, etc., account for 9% of U.S. economic growth. Turning to a comparison with China the most detailed study by Ren & Sun found that in China as in the United States: "Intermediate input growth is the primary source of output growth." Developing China's ability to use division of labour, that is growth in intermediate products, is therefore crucial as this is the most powerful factor on the economy's supply side. But China's ability to use domestic division of labour is greatly hampered by shortage of infrastructure compared to the United States -- efficient division of labour requires ability to transport parts, efficiently communicate and coordinate production, identify markets etc. China's number of per capita Internet users is equal to only 56% of the United States' per capita total. China's lag in "heavy" infrastructure is devastating -- China's per capita electricity consumption is only 27% of U.S. levels, with the country's length of roads 16%, and length of railways at 7%. China cannot benefit from division of labour at U.S. levels with such underdeveloped infrastructure. Under globalisation, division of labour is international as well as domestic. From the launching of economic reform in 1978 until 2006 the percentage of trade in China's economy rose from 9.7% to 64.8% -- China made greater use of international division of labour. By 2014 this had fallen to 41.5% -- China's economy was making less use of international division of labour. Boosting China's trade is a vital supply side reform. Turning to the second most powerful factor of economic growth, China's per capita fixed investment is only $3,199 compared to the United State's $10,017 -- China's per capita fixed investment must be tripled to reach U.S. supply side levels. Regarding labour inputs, due to its one child policy, China's increase in working age population is negligible, and will decline in future, whereas the United State's annual increase is 0.3%. China's long run situation may alter via its new "two-child policy," and more immediately China can partially ameliorate the problem by raising its very low pension age, but the increase in China's total working time will be negligible or negative. Measuring labour quality, OECD studies show China has a high standard up to secondary school but the United State has an overwhelming advantage in tertiary education -- the U.S. ratio of enrolment in tertiary education, compared to the number in the age group in the five years following secondary education, is three times higher than China's. In 2009-2014 annual average TFP growth in both the United State and China was high by international standards at 0.6% in the United State and 0.8% in China -- compared to an average decline for all economies of 0.1%. However, as already noted, TFP is too small a proportion of the economy's supply side to generate fast growth. Analysing numerically the most powerful factors on the supply side therefore yields clear results. To develop towards advanced economy status China primarily requires massive infrastructure investment facilitating development of division of labour, increases in international trade, enormous increases in per capita fixed investment, and huge expansion of tertiary education.